Dynamic Town Creation: The Sun initially doesn't have any towns. Instead, any time a player upgrades existing track a new town is created. This results in a constantly-evolving map that puts an entirely different twist on traditional Age of Steam strategies. Restationing: The Urbanization action has been replaced by the Restationing action, allowing a player to move one city from its current location to a town. All eight cities in the game are fully mobile in this way. Links Capacity: Instead of just increasing Links Size (how many segments of track a good can be delivered across), players have the option to increase Links Capacity, allowing for more than one good to be delivered simultaneously. Instant Production: As soon as a goods cube is delivered, it is replaced on the map immediately with a cube from the production chart. Custom Playing Mat: A custom playing mat designed specifically for Age of Steam Expansion: Sun is included. Union Overtime Fees: Building track has never been more costly, as London's unions charge outrageous overtime fees that escalate wildly for each additional tile that you build. The engineering action streamlines the building process, reducing these costs dramatically. Additional Track Builds: Each player may build up to five tiles of track each turn. At the end of the game, track is worth 50% more than in a standard Age of Steam game. Custom Playing Mat: A custom playing mat designed specifically for Age of Steam Expansion: London is included. 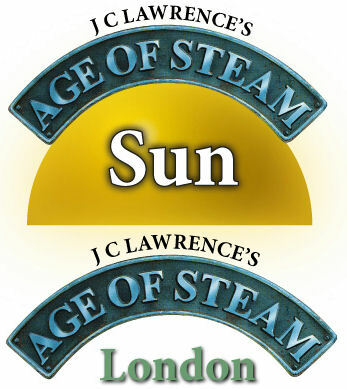 Also included (on reverse side) is Age of Steam Expansion: Sun. Production Details: Printed on double-sided heavy stock in full color, 2 pieces. The included playing mat is double-sided (Sun on one side, London on the other), printed in full color on double-sided heavy stock, one piece. The rulesheet is double-sided full color with clear setup instructions and rule changes from standard Age of Steam play. Other products in the "Age of Steam" series.